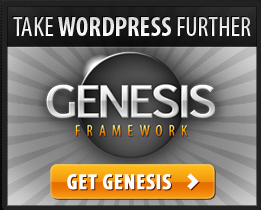 Here’s an incredible offer, jump on the framework I build all my sites on, Genesis. On January 31, 2012, the price goes up to $349.95. That will still be a great deal, but everyone hates to miss out on a better deal, right? The next few days, get it all for a one-time fee of $299.95. Oh, I almost forgot … if you use the code TEN at checkout, you’ll get 10% off the already crazy price. That’s saving you close to another $30. If you’ve not yet heard, StudioPress makes the industry standard design framework for WordPress and currently has 44 striking turnkey child themes to easily skin your site. All the SEO, security, and support that come with the Genesis Framework. 44 current child themes, and all future child theme releases. So, if you were to buy each part of this bundle of digital hotness separately, you’d see the price come in at a whopping $1,187.75. Worth every penny, too. Until January 31, 2012, however, you can get sterling search engine optimization, rock-solid security, tons of turn-key designs, and unlimited sites, domains, and support … all for the insane price of $299.95. And don’t forget … use the code TEN at checkout, and keep another $30 in your pocket. Click here for all the details on the Genesis Framework Pro-Plus package. Find out why it’s the smartest (and sanest) way to build as many fantastic WordPress sites as your heart desires.